The Casio DW-5000C is the first ever G-Shock and was created by the team “tough” which was a team of Japanese engineers employed by Casio. The initial idea was that the watch (unlike watches of that time) would be tough. During the early 80ies the main direction of digital watches were thin and “pretty”, these were more fragile and did not survive “unfriendly or harsh use” and would often “get banged up”. The digital watches were considered to be more of jewellery than timepieces. The DW-5000 I bought off an internet auction was in pretty good shape. The watch did not have the bezel and a broken resin band, there were small scratches on the display as well as on the case back. All the functions of the watch are good including the light. The “though team” wanted a watch that could not only be used by people who did not have an active life, but by people that did. The watch was meant to be used by people with “active” jobs, like construction workers and also while trekking or climbing. The team came up with “The triple ten” idea in 1981. This meant that the watch they were about to design would 1. Have a 10 year battery. 2. Have a water resistance up to 10 atmospheres, and 3. Would endure a drop from 10 meters. The “G” in G-shock means that the watch can suffer a shock from fall as the hardest chock for a human being. One should keep in mind that this watch is 25 years old and would have seen some “action” as it is a sports watch. I began by buffing the case back so that smaller scratches would disappear. I used a diamond compound for the scratches, first one with 3 micron then finished with 1/4 micron. The results came out pretty good. My future recommendations would be not to use 3 microns to begin with but maybe 1 or 2 and just be at it longer so that there’s no risk of uneven grinding. I was lucky that the screws came off easy this is often a problem on old G-shock as they get stuck and broken off. I ordered a new bezel and resin band on the net. When the DW-5000 first came out on the market in 1983 it was not a big success and very few units were sold. Especially the Japanese market did not approve to such a daring model that we now know were ahead of its time. It took a year and a second chance for the team as they came up with the DW-5200 “Hero” in 1984. The watch was essentially the same as the DW-5000 (equipped with the same module 240) but this time people were ready. It became a success in England mostly because of a hockey commercial where a player “slap shoots” the watch into goal. The DW-5600 has the same bezel and band (and can still be found on the net) as the DW-5000 and can therefore be used as replacement parts. The assemble of the watch was easy as the screws had come off and it only took a couple of minutes. As the interest grew abroad the Japanese market followed and G-shock soon became a popular watch. Since the early 80ies the G-shock has evolved and today it comes in many different varieties and models. The end result is very good and it’s a nice watch to wear. Nice information, I have a DW-5200 Hero which is about the same. 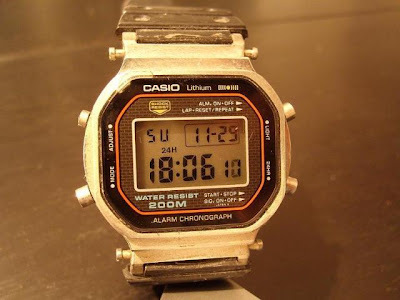 A very good example of an robust 80ies watch! very nice and classic g-shock for sure and i owned the dw-5000, dw-5200, dw-5400 and dw-5500 and still since the earlly 80's that the dw-5000 is my favorite g-shock. Yes I agree, the DW-5000 is one of those watches thats groundbreaking. It´s fantastic that they had the guts to come up with such a different design at that time when everyone else made watches of metal. I am rebuilding one presently, but need to locate the band and bezel model 141F1 or 141F4. Can you please let me know where you found yours on the web? I just dug out my DW5400 module 240 and called Casio for a replacement band and bezel. The bezel crumbled and the guy asked what color my 4 buttons and band buckle were. When I said they were "gold", he said I had a rare type of the Dw5400 because they mostly came with silver. He is sending me the same band of which they only had 3 left. He said it could be worth a couple of bucks to true Casio collectors. He advised me to lubricate the screws before attempting to replace any parts. I only kept the watch for sentimental reasons. I used it when i was a Army chopper pilot and I now own 3 different G shocks. Nice job in restoring that old classic. My parents got me one of these when they first came out. After seeing the 'hockey commercial' I HAD to have one. Wore it for about ten years until the battery ran out and lost it somewhere along the way. Wish I still had it. thank you for posting, I just knew this that there is a restoration of DW-5000C gshock, very informative site. My DW-5000C was still at the good condition, i purchase this last year at PIJ. This site be a helpful to the people or maybe to me on soon. thanks a lot. Hi, where can I buy the DW5200 bezel? In my wach dw 5000 light dosent work , how can i fix ?